A rather large book caught my eye this week, while perusing the Bookazine shelves. 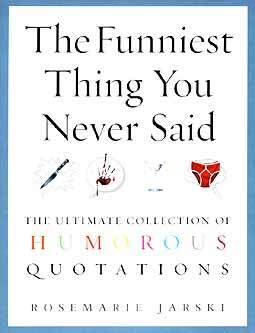 The Funniest Thing You Never Said (Random House, 2004, ISBN 0-09189-766-1) has been compiled by Rosemarie Jarski, who admits to being suspended from convent school for narrating risqu้ jokes in the chapel. Her book is a large collection of jokes and witticisms, and even risqu้ in places, so the suspension did not teach her much! Apart from that, there is not much more that Ms. Jarski reveals, I’m afraid. The almost 550 page book is divided into sections, each of which has further sub-sections. These include Humanity, Sports and Leisure, the Natural World, Arts and Entertainment, the Word, Science and Technology, Society and Politics, Nations, Universe, the Body, the Brain and the Mind. In the introduction, Ms. Jarski suggests that this is the book to stop you being caught verbally flat-footed at an important gathering. “The smart remark, the snappy comeback, the sharp one-liner would always be there at your fingertips” is the promise, and indeed the smart remarks, snappy comebacks and sharp one-liners are all there, but unfortunately not in a rapidly, instantly downloadable format. The book is too large to fit in a jacket pocket, and indeed would need a medium to large plastic bag from Tesco-Lotus to make it portable. Hardly the item worn as a fashion accessory by the deliverer of rapid repartee. But that is really the only downside of this book. It certainly is a wonderful resource, though I would personally prefer a hardcover imprint, if one were to be keeping it on the shelf. The contents are well itemized and it also has an index of witty contributors at the back. Ms. Jarski has decided that the index should indicate the person who spoke the lines in some TV series as the originator, which is not quite strictly correct, as it is the scriptwriter or gag-writer who should get the credit, not the talking head. However, semantics aside, it is a good effort from the compiler. It would be hurtful not to let a few of these gems on to this page, so try these for size: “A woman’s rule of thumb, if it has tyres or testicles, you are going to have problems with it” (Ella Gough); “Lord of the rings is simply unreadable, and for me that always sort of spoils a book” (Will Cuppy) and that has to be the book reviewer’s ultimate expression of despair, “I was once so poor, I didn’t know where my next husband was coming from” (Mae West), and finally “I took a speed reading course and read ‘War and Peace’ in 20 minutes. It’s about Russia” (Woody Allen). At B. 450 off the shelves at my local Bookazine outlet, this was a cheap week of laughs and giggles. For anyone who has to give speeches, it is a reference book to keep handy, and for someone who likes to drop anecdotes in the pub, it is the ideal resource manual to keep hidden, so that your friends think you are genuinely an original wit. After two more albums another founding member in the shape of drummer Bill Bruford would leave. However, to be fair, he jumped rather than being pushed. This left YES with an everlasting reputation for having a revolving door style line-up. Very rarely have two consecutive albums been recorded with the same line-up. At one time in the early nineties there were actually two line-ups touring under the YES banner, and then they all (eleven of them to be precise) combined for one ridiculous tour and album. After being dumped by YES, Tony Kaye first set up his keyboards with old cohort Peter Banks of Flash and helped them record their first album, the self-titled ‘Flash’ (1972). After the recordings were completed, Tony realized that Flash was actually Peter Bank’s band, and perhaps it would be better if he went on to set up his own band under the Badger moniker. After a handshake the pair went their own ways; however, unlike many of the other past members of YES, Tony and Peter have remained friends to this day. Bassist David Foster was the first to be signed up, having come to Tony Kaye’s attention when he was playing with Jon Anderson of YES in a band called the Warriors. Next to join was one of the true warhorses of rock drummers, Roy Dyke. He had previously been with Remo Four; Family; and represented one-third of Ashton, Gardner, and Dyke, who had scored a worldwide smash hit with ‘Resurrection Shuffle’ in 1971. The fourth member to join was a very young Brian Parrish on lead vocals and guitar. He proved to be a very good addition as he arrived with a bag full of ideas for songs as well as having a guitar style that was vastly different to anything like Kaye’s former band styles, therefore lessening the comparisons. Feeling that the band might be left behind in the fame stakes if they didn’t get an album out on the record racks at its earliest opportunity, the Rainbow theatre was booked for two concerts in mid December 1972, both of which were recorded for a live album; a very novel idea for a debut album. 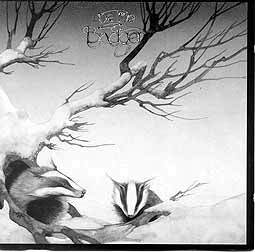 When the album was released in early 1973, it came in a gatefold sleeve designed by Roger Dean with pop up badgers when you opened the artwork. With a blaze of publicity from their label Arco Records and the gimmicky artwork, the album broke into the bottom of the top thirty in both America and Great Britain. Unfortunately, that is just about the last of the good news for this Badger. After early good sales they soon dropped off. The music was competent, proficient even, but certainly not startling enough to keep the public’s interest, even though some of the guitar/keyboard duels are extremely exciting. There are only six songs on this album, but it still clocks in at a very respectable forty-two minutes. Closing song ‘On The Way Home’ has one of the heaviest organ introductions you are ever likely to be lucky enough to hear. On the downside, the songs all tend to sound a bit the same, which I believe is due to the band not having had enough time to bond sufficiently before going into a studio, where they could of perhaps worked out some better song structures. At least it would have allowed them to get to know each other’s strengths before unleashing them on the public. The other huge glaring mistake was the lack of a front man. Although Brian Parrish’s singing is not bad, it certainly is not good either. By the end of the first tour Parrish and Foster were let go to be replaced by ex-Stealers Wheel guitarist Paul Pilnick and Roy Dyke’s old band mate Kim Gardner. The search for a front man was settled with the addition of Jackie Lomax, a very charismatic and talented soul singer, but definitely not the man to put into what was supposed to be a rock band. This was definitely a classic case of “wrong man, wrong place”. The band then went into the studio to record the studio album ‘White Lady’ (1973), with all the songs written by Jackie Lomax. With so many influences within the band - rock, funk, soul, reggae, jazz, pop, and to top it all a progressive rock keyboard player - the music released upon the public was some of the worst ever to be released by a major label. Fortunately for those involved, the band had already disbanded in disarray by the time of its launch, so no embarrassing post mortems had to be endured. What a sad end to a great idea. Even so, the first album has its moments to remember Badger by, but you have been warned about the dreaded ‘White Lady’. You don’t get the pop up badgers with the CD release either, what a swizz.